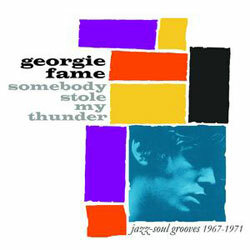 Georgie Fame’s CBS output is back under the spotlight for a new compilation CD – Somebody Stole My Thunder (Jazz-Soul Grooves 1967-1971). It’s a mixed bag of material, headed up of course by the title track and regular mod dancefloor filler, as well as a number of soul and soul/jazz tunes (as the title suggests), including the likes of Knock On Wood, Roadrunner and the marvellous Seventh Son. And there’s some material new to CD, notably a live take on Parchman Farm. Read on over the turn for the full tracklisting. It’s out on 30th July, look out for a review on here. 18. Is It Really The Same?